As always, we’d like to thank everyone who fished with us during September and those who intend to fish with us in October. Without you, we’re stuck at the dock. We greatly appreciate your business and hope that you’ll come back to see us soon, especially our junior anglers who are picking out Halloween costumes that will be sure to drive their parents crazy. The early fall weather has brought a bit of wind and some occasional sporty seas but the weather has also energized the baitfish and the fish that follow. Our morning and evening trips have been producing well for all of our clients and the heat and humidity has made things a bit more comfortable out on the water as an added bonus. 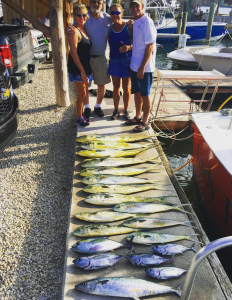 The Mahi Mahi have been EVERYWHERE in recent weeks! We can’t get away from them! 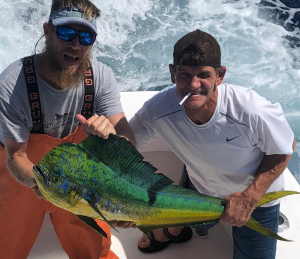 Our clients caught gaffer-sized Mahi (10 – 20 pounds) as well as smaller Mahi under the steady stream of weed patches that continue to be blown in from the Bahamas and from the Eastern Atlantic. We’ve been catching our Mahi Mahi between 300 and 500 feet of water on rigged ballyhoo and bonito strips with blue/white skirt combinations. We’ve also caught many on live baits tossed at the weed patches or underneath frigate birds. The Blackfin Tunas and Bonitos can still be found up on the reefs in the 5 to 10-pound range inside of 200 feet of water trolling Sea Witches and Bonito Strips at 5 – 6 knots. The Tunas and Bonitos are keeping drags screaming and clients smiling. Kingfish in the 10 to 15-pound range are still biting between 80 and 120 feet of water, with bonito strips, lures and feathers trolled below the surface on planers producing the most fish. “Kings” have also attacked our live baits on the drift as we target Sailfish in 120 feet of water. The Sailfish bite continues to improve as the Fall weather patterns take shape. We continue to catch Sailfish trolling the color changes between 100 feet and 300 feet of water. The Sailfish have been attacking Sea Witches (in blue/white and pink/white color combinations) trolled on the surface at 7 – 9 knots but the bite is switching over to live baits. Sailfish are starting to prefer live slow-trolled ballyhoos or goggle eyes dangling from a kite inside of 150 feet of water. The Sailfish bite will only get better as we make our way to Winter. The shark fishing continues to be Fantastic! We continue to average between 1 and 2 sharks – or more -each trip. During the last few weeks, we’ve seen a flurry of Silky Sharks and Blacktips as they chase the migrating baitfish that head down just off of our beaches every Fall. There have also been some huge Hammerheads coming up to empty a spool every once in awhile. All of the sharks were caught either on Bonito or Kingfish dropped down in 300 feet of water. As Halloween approaches, the Fall bait migrations should be in full swing on the beaches and on the reefs, which should lead to ever-better fishing. Ask about our Fall Tarpon Charters to catch one of these prehistoric acrobats as they follow schools of bait down the beach. 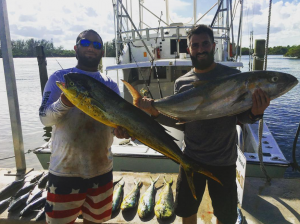 For those of you planning to visit Fort Lauderdale for the Fort Lauderdale International Boat Show at the end of October, now is the perfect time to book a trip with Fantastic Sportfishing to reserve your crew.